The theme this week refers to the number of the current week of the year…32 out of 52. Difficult to believe more than one-half of the year has passed us by and I feel I still have many stories to share. This theme was vague and left me to ponder many ideas. I considered looking up important events that happened during different ancestors’ 32 year of life. Fortunately Ancestry.com makes this an option with their timeline feature. Most of the female ancestors I looked up had given birth in their 32nd year. Quite surprising when you consider 32 years old seems older than we usually think about for childbirth these days. My other thought was to find important events ancestors had lived through in the “32 years” – 1632, 1732, 1832, 1932 and so forth. Unfortunately, this was much more difficult than I imagined and I’m ready to send Ancestry a suggestion for another feature they can add! I settled on 32 questions I would like to ask an ancestor. Specifically, I chose 32 different ancestors and have one question for them to answer. If somehow from the great beyond they are able to send me the answers, please do so-preferably in a typeset page and signed by you or a letter written in your best penmanship, sealed with your personal seal in red wax. Asking too much? 2nd Great Grandfather – August Yess – Why did you leave Germany and who were your parents? You’ve always been a difficult nut to crack and I seem to be willing to go to all ends of the earth to solve this one. I’m learning German language this fall just to find clues! 2nd Great Grandmother – Permelia Jane Ellis Chenoweth – You had brothers and nephews and cousins who were involved in the Civil War. What kind of impact did it leave on you? 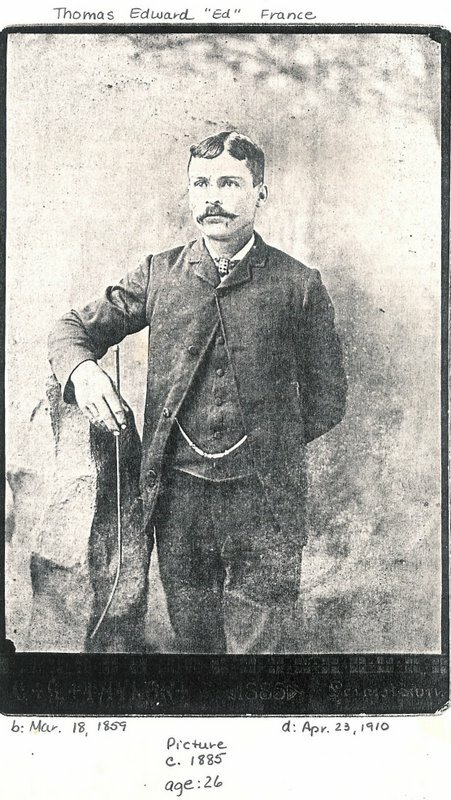 2nd Great Grandfather – Elias Birdine Chenoweth – In your business papers, I have found many papers where you lent money to others and deeds where you purchased land. What was your secret of business? 2nd Great Grandmother – Eleanor Senate Lawrence – What is the importance of your middle name? I don’t seem to find any other connection to tell me why you have “Senate” as your middle name. 2nd Great Grandmother – Veronica Bootz (Schmitt) Smith – Was my 2nd great grandfather your second husband? Some records seem to indicate that might be the case. 6th Great Grandfather – Hammond Harrison – You were born around 1715 in Yorkshire, England. What was your occupation and what was your day-to-day life like? 7th Great Grandfather – John Chenoweth – You were born in St. Martin’s, Cornwall, England. In 1682 at age 23, you had immigrated to Baltimore, Maryland. How difficult was the journey and why did our family choose Baltimore? 3rd Great Grandmother – Mariah Sherman – Are you related to General WilliamTecumseh Sherman? 3rd Great Uncle – Jonathan McBride Brown – You served in the 78th Ohio Volunteer Infantry in the Civil War, but your son in law served for the Confederate Army. Did you ever meet in battle? 4th Great Grandfather – Michael France – You were born in 1776 in Virginia. What did your family share with you of that historic year? 2nd Great Grandfather – Daniel Medi – You and Mary had eight daughters and everyone of them had the first name of Mary. (Mary Josephine, Mary Victoria, Mary Margaret, Mary Augusta, etc) Beside the fact you apparently were a devout Catholic, what were you thinking? Great Grandfather – Thomas Edward France – You were sent West for your health and you went to the middle of Kansas. Why did you pick Kansas? 3rd Great Grandmother – Eliza Jane Hulvey Sheets – During the Civil War, you went west to Illinois and during the trip, you and your children became ill with diptheria. Who cared for you and when did you find out that four out of five of your children had died? 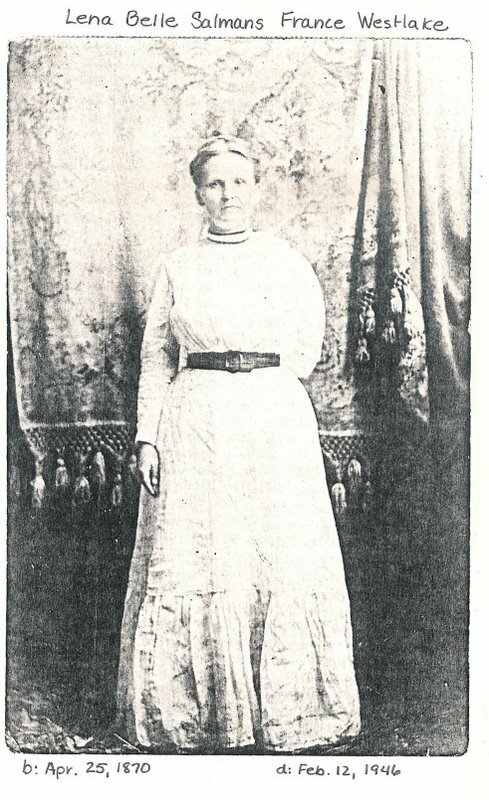 Great Grandmother – Lena Belle Salmans France Westlake – You lived in Kansas on the prairie as a young woman. What was your life like helping to take care of your siblings in those days? 3rd Great Grandfather – Christian Swise – You were born in Hanover, Germany, but by age 26 you were in the United States and getting married. Tell me what brought you here and about the journey. Great Grandfather – Thomas Edward France – Please tell me the story about you holding my grandmother, Vera, and your sister asking you what “brat” that was? How did that make you feel? 2nd Great Grandmother – Teresa Hanlach Yess – You and my great grandfather, Augustus, came to Peoria, IL in the 1850’s and amassed quite an estate. You outlived him and five of your six children. How did you hold the estate together and who did you rely on? 2nd Great Aunt – Amanda Yess – Documents show you were in a mental hospital in Bartonville. What challenges were you facing that caused this? 2nd Great Aunt – Sarah Alice Salmans Abbott – You were the oldest of 10 children of Levi Franklin and Rosa Jane Brown Salmans. Your mother died when you were 22 and you remained at home until age 33 to take care of your siblings. When you did marry at 33, tell me what your wedding day was like after caring for this large family? Grandfather John E. Yess – You lost your father before you were a year old. When you were two, your mother remarried. What was your relationship like with your step-father? Great Grandmother – Mary Josephine Medi Yess Hargadine – You lost your father and mother within the same year. One year later you gave birth to your second child, and within another nine months your husband passed away. What did you do to survive? Great Grandmother – Amelia Jane Harrison Smith – You were born in 1868 and lived 83 years. You came from a large family. How close did you remain to your siblings throughout your life and what did you do to stay in touch? 2nd Great Grandfather – Johann B. Schmitt – John Smith – You were born in Bavaria in 1828 and immigrated to the United States. What were your thoughts when you changed your name from a German version to an English version in 1856? 3rd Great Grandfather – Solomon Harrison Ellis – You were born in Georgia in 1805. Why did you move to Illinois even though it appears the rest of your family remained in the South? 4th Great Grandfather – George Ellis – You were born in Mecklenburg County ,Virginia; by age 11, your family lived in Rowan County, North Carolina. You died in Copiah County, Mississippi. Tell me about the journeys of your life and why you moved so often? 6th Great Grandmother – Alida Lydia Pruyn Logan– (1707-1788) You lived in New York until you were 40 and then you and Andrew show up in South Carolina. What was happening in South Carolina in the 1770’s and 1780’s during the Revolutionary War and how did it affect you? 5th Great Grandfather – (Major) Francis Logan – According to a descendant’s SAR application, you served as a Captain in the camp at Ninety Six, SC during the American Revolution. What did you witness there and during your 93 years of life? Grandmother – Jessie Smith Yess – I was fortunate to have you to ask questions of for much of my life, but what did you enjoy playing when you were a child? I think you were a tomboy, is that correct? 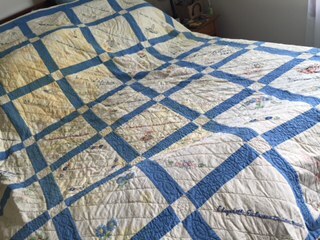 Grandmother – Vera France Chenoweth – Again, I was able to ask you many questions first hand, but you were very talented at crocheting, tatting, and sewing. Who taught you these skills? Grandfather – Elzie Chenoweth – You answered many of my questions about family when I was a child, but was your mother a good cook and what was your favorite meal for someone to make for you? To all my ancestors – Did you ever feel you would be forgotten, because you haven’t. I’ll let you know if I get any letters posted to me with red wax seals on them. He was 29 and a bachelor who had moved to Kansas to take advantage of what was thought to be a better environment for his health. She was 18, the third oldest daughter of a family of ten. She had lost her mother in December of 1888 due to childbirth and now was taking in laundry and baking for bachelors in the neighborhood. Her next oldest sister had been married just a year before while Mother was still living. Belle was not so lucky. She was not married until after her own mother’s death. 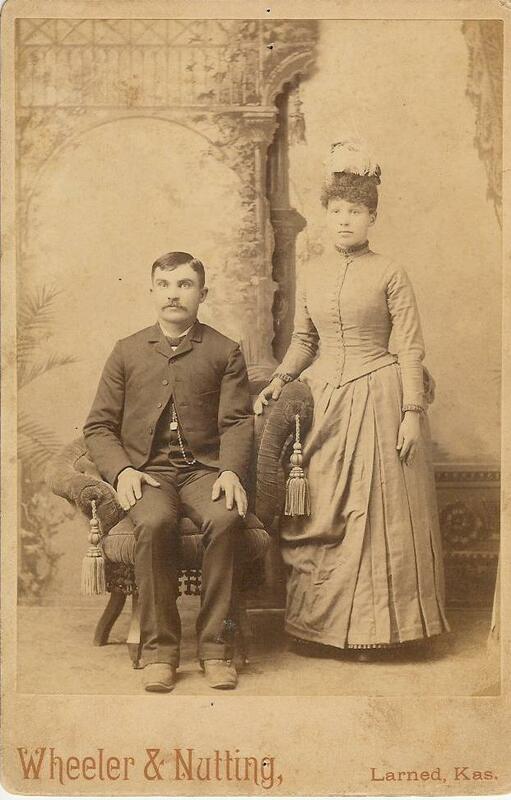 Thomas Edward France and Lena Belle Salmans were married on the 17th day of February 1889 most likely in Larned, KS. The photo above was of their wedding day. After living in Kansas for nine and a half years, Ed and Belle made their way back to Illinois to attend Ed’s mother’s funeral. Lavina Clanin France had died at the age of 60 years. Ed’s father, John, was still living in Fulton County, Illinois. Ed and Belle had two living children by this time. Lola was born in 1890 and Lee was born in 1892. An infant daughter had died in 1895. Ed, Belle, Lola and Lee supposedly took the train back to Illinois. Once there, John France asked Ed and Belle to remain in Fulton County and set up housekeeping in his house. He was 63 years old and didn’t want to keep house by himself. It was well past six months before Belle could return to Kansas to bring back their things and say goodbye to her family. 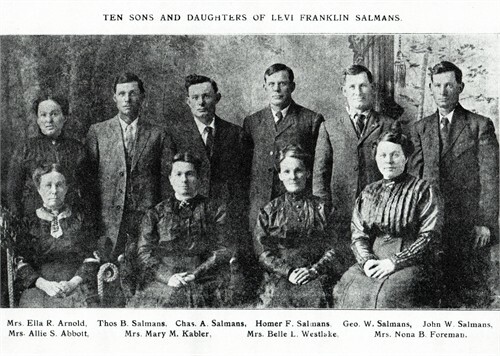 The remaining nine Salmans siblings all lived in Kansas until their deaths. Belle would never return to live there, but merely to visit her siblings.Two more children were born to Ed and Belle – two daughters – Essie in 1899 and Vera in 1902, but their son Lee died in 1906 of pneumonia breaking his parents’ hearts. At the age of 51, Ed succumbed to pneumonia and died in 1910. It’s hard to say if abiding by his father’s request to move back to Illinois actually caused his demise. Breathing issues are what had prompted his move west in the first place. Nevertheless, Belle was left with a farm, a father-in-law, and four children to care for. Her daughter Vera often commented on Belle’s industrious nature and “farming” intelligence. She was well known for the quality of her horses. She managed the farm and put her share of physical labor into it with the help of a hired man, Milton Westlake. Westlake was a widow also and worked for Belle for five years before they finally married in 1915. 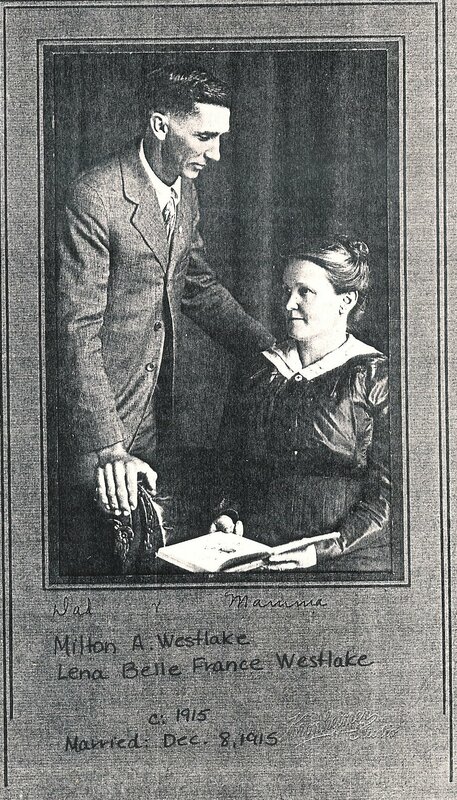 December 8, 1915 Milton A. Westlake and Lena Belle Salmans France married, both for the second time. Belle was 45 years old at the time of her second marriage; Milt was 47. They were together for 31 years until Belle’s death. She looks very proper in her first wedding photo. She was only 19 at the time of her wedding and the world had no doubt weighed heavy on her shoulders. She looks very happy in her second wedding picture. 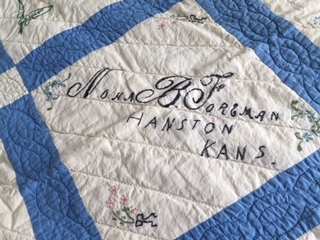 Her children were grown, She had moved from Kansas to the France farm in Fulton County, IL and then moved again when the government bought her farm for an army camp. Her life was ever-evolving. She was a pioneer in more than one way during her life, yet she seemed to embrace the happiness of a new marriage and a new companion later in life. it would be interesting to hear how different her thoughts were at her wedding at age 19 and her wedding at age 46. What comparisons and contrasts could she provide. What perspectives on life could she offer. I hope to get to ask her someday in the Great Beyond. For where all love is, the speaking is unnecessary. It is all. It is undying. And it is enough. She would see a lifetime of loving – more than many would experience. Ten siblings who lived to adulthood; an infant brother who died at birth which led to her own mother’s untimely death within the year. Two husbands, five children, step children, grandchildren and love and admiration from friends and neighbors filled her life. 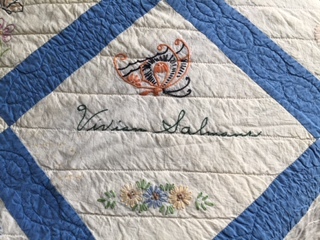 Her love was romantic, self-sacrificing, heart-wrenching, late-blooming, but Lena Belle Salmans France Westlake, who was my great grandmother, wasn’t one to talk about her love, for as Diana Gabaldon says, “the speaking in unnecessary”. She was born on a farm in Ohio in 1870, the third of 11 children. How difficult for a farmer and his wife to have three daughters as their oldest children back in the late 1800s. Boys were needed for labor on the farm. The girls would have to learn to work like men to help with the farming. They learned not only the physical labors of the farm, but the knowledge of running that farm as well and four boys, including twins, followed the three girls. Grandpa Levi and Grandma Rosa Jane Salmans had their labor. No doubt there was an overflowing bin of love on that farm. Ten children and two parents in a small farmhouse in the late 1800’s led to intimacy not known by today’s modern families. The yearning love of seeing wide open prairies without the hint of smoke from the neighbor’s chimney called to my 2nd great grandfather to keep moving his family west – eventually to the middle of Kansas. The death of the eleventh sibling and her mother caused Lena to take jobs doing laundry and baking bread to help make ends meet. It would also lead to her next love, my great grandfather, Thomas Edward France. Ed bought bread and brought wash for Lena to do since his bachelor skills were found wanting. Love bloomed and two daughters and a son were born before fate took them back to Ed’s home farm in Illinois. Ed’s mother had died and his father asked Ed and Lena to stay on and run the Illinois farm for him. Lena’s love for Ed must have given her the strength to leave her close-knit family in Kansas and move back to Illinois. Two more daughters followed in Illinois and the daily living of a marriage kept the family going. The death of her only son, Lee at age 14, wrenched her heart and she put her love into the remaining children she had left. In four short years Ed would be gone to pneumonia, leaving Lena with the girls to run the farm. A widower down the road, Milt Westlake, worked the farm with Lena. Her strong will, savvy farm business mind she had learned from her father and love helped her persevere through the troubled times. Six years later, Milt and Lena married. She had once again found love at age 46. They ran the farm together. She and Milt were able to make a few trips back to Kansas to see her family and nieces and nephews. The love of her family never left her. She and Milt would be married 32 years before his death. Many years after having baked bread in Kansas, she was still known for her baking. Her grandchildren loved her cookies. Grandma Westlake’s cookies were prized above all sweets. They loved her upstairs bathtub too! Running hot water in the upstairs bathroom led to baths at Grandma’s house on Saturday nights. Love letters didn’t survive her. Most likely the love was hidden in the day-to-day details of life on the farm and family doings. Admiration of her family, love of her grandchildren, love of the children and husband she had lost likely never left her, but love persevered and shown through. It was undying and it was enough.